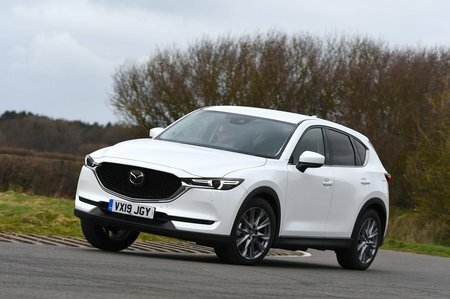 Mazda CX-5 2.0 SE-L Nav+ 5dr Auto 2019 Review | What Car? What Car? will save you at least £1,347, but our approved dealers could save you even more. The Mazda CX-5 is one of the best large SUVs you can buy. Why? Well, it may not have the additional practicality of seven seats that a Peugeot 5008 comes with as standard, but it's well priced, very well equipped, safe and classy inside. Stick with the 2.0 petrol in entry-level SE-L Nav+ trim for the best value for money, although the diesels are well worth a look if you do above average mileage. You get a healthy amount of kit even choosing the entry-level SE-L Nav+ model. The highlights include 17in alloy wheels, front and rear parking sensors, adaptive LED headlights, privacy glass, power-folding door mirrors, dual-zone climate control, 40/20/40 split-folding and reclining rear seats. Infotainment includes a 7.0in screen, a DAB radio and Bluetooth, while among the safety features are automatic emergency braking, lane assist, blind spot monitoring and rear cross traffic alert. The sole petrol option is a 2.0-litre (badged Skyactiv-G 165). Unlike nearly every other modern petrol engine, it doesn't benefit from turbocharging, so you need to rev it hard to get the best from it. Mind you, there’s just about enough low-rev oomph to help you make easy, relaxing progress – as long as you aren't in a hurry. Much cheaper than the diesels, which is why it's our pick of the range.